Twenty years ago, in the year 1994, I worked at a boutique talent and literary agency in Beverly Hills named Media Artists Group. For some perspective, Dean Martin and Bob Hope were still alive, Married with Children was still on the air, and The Simpsons was only on it’s 5th season. Another Simpson, OJ, was still just a football player who starred in some funny movies with Leslie Nielsen. was a paid intern. I served under the tutelage of agent Raphael Berko and his assistant at the time, Jeff Denton, two people with an ever-growing amount of good stuff on their plates. Jeff was the first person to show me how to do script coverage (as well as how to answer phones, pull headshots for the daily breakdown submissions, and deal pleasantly with an ever-growing pile of submitted spec scripts and their roster of constantly-calling screenwriters). Raph was the best kind of agent: one who thought on his feet. When a last minute call came in for a “goofball, lanky teen type” to star in a basketball-themed Butterfingers Bites commercial, Raph suggested to one of his commercial partners, Caroline, to send me, a non-actor, racing across LA rush hour traffic to the now-demolished IRS Records building across from Universal City, on an audition. I never saw the commercial, but those two chubby red-headed twins from the Doublemint gum commercials were the guys waiting in the lobby when I came out of my audition, so that day I knew I was playing in the big leagues . Flash forward 20 odd years, to me today, going through some burned “backup” CD’s from the 1990’s. And what is it I find? A pile of my old script coverages, including my first one ever, written for Raph and Media Artists Group. Boy howdy, what a find! Someone who runs a script coverage company finding their first ever script coverage, why, that’s like a professional fisherman digging through the attic and finding the first fish he ever caught. And I mean that comparison fairly literally, as both said finds compare quite accurately, relative to the categories of dustiness, desiccation, and general lack of utility. But nonetheless, I’ve busted it out for all to see: my first script coverage. Ever. And let me just warn you… it’s pretty bad. To give you a little more context, I was still in college, had taken maybe a single screenwriting course ever, (I hadn’t any access to any newbie script reading tutorials and videos like we have in our own Script Coverage Academy) and was still, to some degree, suffering from the aftershocks of puberty. As you can see, I left a lot of the headers blank, as I didn’t know what they meant at the time. I thought they might be some sort of fancy-shmancy SAG thing, or WGA thing. Little did I know they meant Submitted To, Submitted By, and Submission Type. They’re not commonly used fields in typical script coverage, but they come in handy if you’re in a studio or development office with thousands of submissions coming in weekly, and to various members of the staff. Scripts get passed around a lot, so it’s good to know who it originally was sent to. Similarly, the submission type can be important if you’re a lit agency and in addition to screenplays you also receive novels, treatments, kids’ books, and everything else imaginable as a submission. In my experience case at Media Artists, there were I believe 10-15 agents who handled talent, in both tv/film and commercial capacity, as well as literary material, so it was usually okay to leave off the SUB headers. But it’s page 2 that really demonstrates the difference between who I was as a script analyst then, and who I am as a script analyst now. Back then, I was curt, brash, and angry. 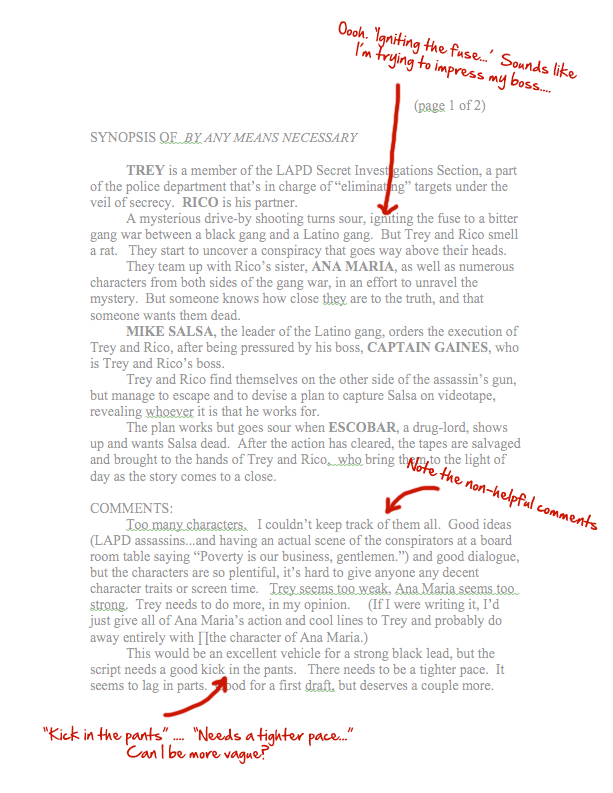 Any script that didn’t measure up to my standards, I tore it apart in the coverage. This particular script was one of my kinder reviews. It’s funny to see how I’ve rounded out and have become more patient with my coverage comments. I almost don’t recognize the young turk, writing with such vapidity. This was someone’s hard work. They spent months, perhaps even years on this screenplay, and here I am as a 20-year-old kid at an agency basically just brushing it off with a paragraph. “There needs to be a tighter pace,” is pretty much the sum total of my input. How is that supposed to help a screenwriter? How is that supposed to help a producer? Perhaps more importantly within the context of my relationship with my employer, the agent: how is that supposed to help him figure out whether or not this is a good script or good screenwriter worth pursuing? I’m happy to report that since this first coverage of mine, written over 20 years ago, a time when the Earth still had seasons, I’ve rounded out as a script analyst. I think. That is, I’m pretty sure I’ve calmed down a lot. And in doing so, I’ve been able to accumulate experience and smarts enough to let me approach script coverage in a way that’s more constructive and helpful to all involved, and hopefully lets me empathize more with my fellow screenwriters, and my fellow agents and producers and filmmakers of all stripes. But it’s weird to think that without this first, clumsy step in my script analysis career, made 20 years ago, this blog, this website, my entire career as a screenwriter and/or script analyst, wouldn’t’ve happened. Weird and weird and weird. 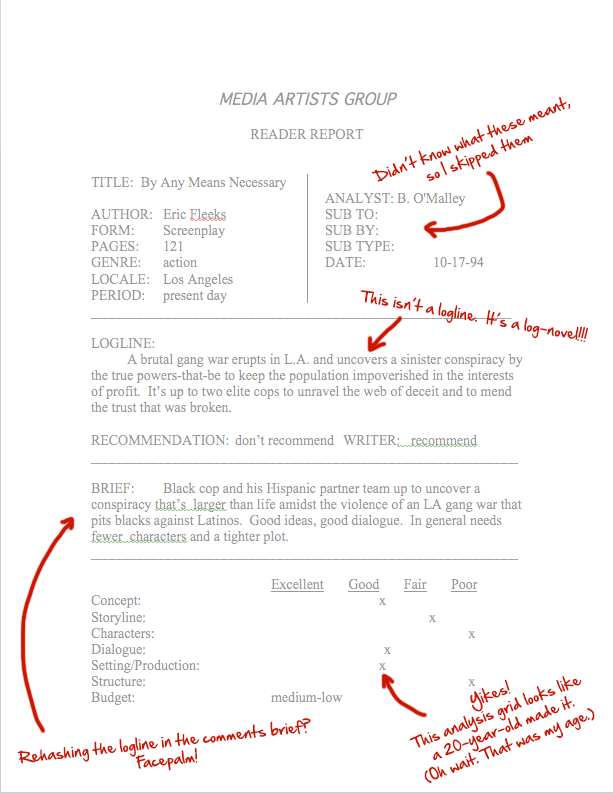 Here’s a link to the script coverage PDF itself, in case you wanted to see the horror up close. Hey Jeff! Hope all’s well, old chap! To clarify though: if I ever know what I’m doing, rest assured, I’ll be immediately hit by a bus.